Sunday’s Catalan MotoGP race takes place 69 years to the day after the first MotoGP race (OK, the first 500cc world championship race), staged on the Isle of Man on 17th June 1949. That race was won by Harold Daniell on a factory Norton single that nudged 135mph in top gear. Last Friday Peter Hickman established a new TT lap record of 135.452mph while on his way to victory in the Senior TT, averaging 44.8mph faster than Daniell’s winning average from 1949. At the end of the race he held aloft the exact same trophy of Mercury (the Roman god of financial gain, travellers and luck, trickery and thieves and the guide of souls to the underworld) that Daniell held in June 1949. Hickman set the record on his final lap of the six-lap race as he chased down Dean Harrison. His winning advantage was 2.06sec, after one hour and 43 minutes of racing, with both men riding different makes of bikes on different brands of tyres and not once seeing each other during the 226 miles. Last year the average winning gap in MotoGP was 2.2sec. The race record also went, for several reasons. Unusually, it didn’t rain during race week, so by Friday there was a good layer of rubber on the racing line, which increases grip. Also, Hickman and Harrison seem to have raised TT riding to a new level. That’s what happens in any sport: someone raises the bar and everyone else has to catch up. It’s what Marc Márquez did in MotoGP. Hickman and Harrison rode the 37¾-mile course in short-circuit mode, with jaw-dropping commitment and precision: laying rubber accelerating out of the corners, elbows within inches of the road through the slower parts of the course, Hickman fully drifting his BMW S1000RR near the top of the Mountain Mile at around 180mph. Most of the TT course is tackled at that kind of speed and more, with riders flat out in sixth gear for a mile and more through the fastest sections. Watching the racing via onboard cameras, most people new to the TT cannot believe that the film hasn’t been speeded up, because trees, buildings and spectators rush past either side as if viewed from the Millennium Falcon at war speed. Hickman first raced at the TT in 2014, to earn some money. This isn’t uncommon these days. Riders*aren’t paid any prize money in BSB, so they have to race elsewhere to pay the bills, never mind the extra risk. Some of these riders don’t take to the unique demands of the TT, others do. Obviously, Hickman is one of the latter. He has fallen in love with the place and now speaks of “this magical island”. There is no bigger adrenaline rush in motorcycling. 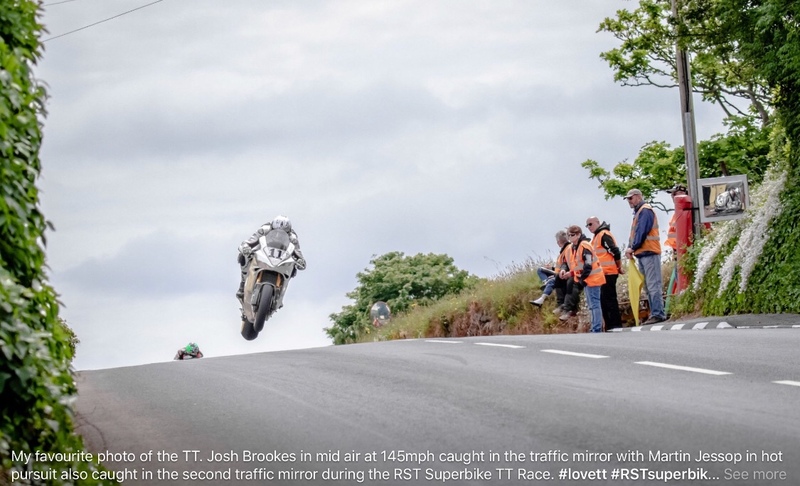 But it’s not merely the buzz, because there is something almost spiritual about racing around the TT course. The combination of the elation of rapid motion through space, the realisation that each mistake might be your last and the resultant feeling of all of your senses ablaze as you thread the eye of the needle at frankly ridiculous speeds is a heady emotional cocktail that affects you in a way that no other racetrack can. In the MotoGP paddock the TT is a tricky subject. Some people love it, some people hate it and others simply shake their heads, unable to comprehend what it’s all about, because it’s a million miles outside their own experience of racing motorcycles. Since 1911 the Mountain course has claimed 275 lives, including Dan Kneen and Adam Lyon during this year’s practice and race weeks. The TT is dangerous. Motorcycles are dangerous. I’ve lost friends and loved ones to the TT, to short-circuit racing, to road accidents. To alcoholism, also. Over the last 40*years I’ve hated the TT, fallen in love with the TT, hated the TT again and then fallen back in love with it. In fact, this back-and-forth process is continuous, changing from day to day according to what’s gone down on the Isle of Man. However, it’s my fervent belief that as adults we all own our own bodies and can do with them what we like, so long as we’re not hurting anyone else. Of course I feel uneasy about the TT and other races on public roads. But there are also times when I feel uneasy about MotoGP. And I am absolutely sure that I feel more uneasy about schoolkids racing Moto3 bikes than I do about grown-ups racing at the TT. Motor Sport extends its condolences to the family of Andreas Perez, who died following a Moto3 Junior World Championship accident at Cataluyna. Russian roulette would give a similar rush with similar results , much more decisive though. I respect the participants and the spectators, but when you know someone is going to die every year for that event leaves me wondering ?? Only one thing I dislike about TT week: For past 3 years after the superbike and superstock race I want to buy a BMW S1000RR and throw a full Akra or Arrow on that biatch!!! And man the superstock and senior TT were bonkers!!!! The supersport race reminded me how really good and all round performance a 600 can offer us. I think this is one of the best pics from this year. IMO. This is some of the best fottage of the TT I have seen in a while turn the sound up & enjoy. imagine if five people died in the A-League Grand Final each year. what would happen in Australia ? helmets , body armor , more rules, less contact, more control of the so very dangerous sport. the sport of soccer would suffer if people started dying or died on a regular basis. that is the counter argument to the cotton wool society argument. which I kinda agree with your assessment , but overall I think the deaths at the TT are bad for the sport in general- though the TT is fun to watch and live and let live etc.